This was taken from the bottom of the top flight of steps, below the footway across the Transporter. Since I last took such a picture in 1985, the waste incinerator near the Newport Bridge has gone and the Princess Diana Bridge has appeared. After all the demolition on the ICI site, it is surprising that the big nitro tower in Haverton Hill is still there. I have a lot of memories about when my brother Tom and me used to try and catch wild pigeons ‘scratting around the Transporter bridge forecourt’, there was dozens of them. One Saturday we were making our way home from the Transporter and at the crossroads outside Middlesbrough railway station. Tom, unfortunately, walked in front of a BRS parcels waggon and got knocked down and almost killed. There were 3 doctors passing who had just got off a train who rushed over to help, a crowd gathered and an ambulance arrived to take him to the hospital with a broken arm and shoulder. This would be around 1951, in the days when the Tees Dock had huge ship moored nearby, and St Hildas market was thriving. Tom was released eventually and mended well. I remember going here on a geography trip from Grangefield Grammar School in 60/61. We climbed the stairs to the top and crossed over the river. It was a bit unnerving to say the least when the trolley came across and all the plates were buckling and groaning as the carriage was brought transported over. So Jimmy Nail and his team didn’t demolish it????????????? There is an extremely quick lift to the top, but the steps are only on the Middlesbrough side, so it is now impossible to actually do a complete traverse from Middlesbrough to Port Clarence. You also need to check when the Bridge is open. The gondola, carrying cars also only operates for a limited number of days of the week.. There is quite a nice little exhibition on the Middlesbrough side about the history, where you can also get teas and coffees. 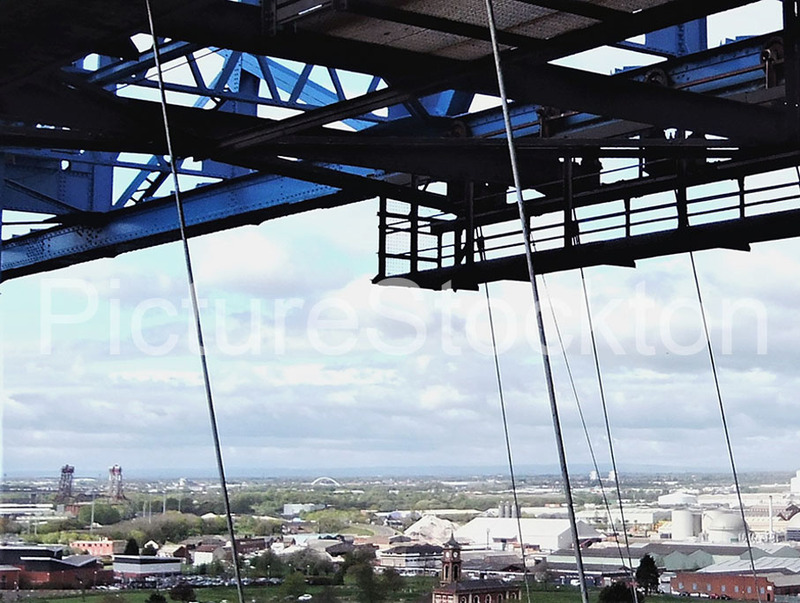 If you are interested in industrial history its also worth visiting Stockton’s Newport Lift Bridge and the Billingham Branch Bridge. 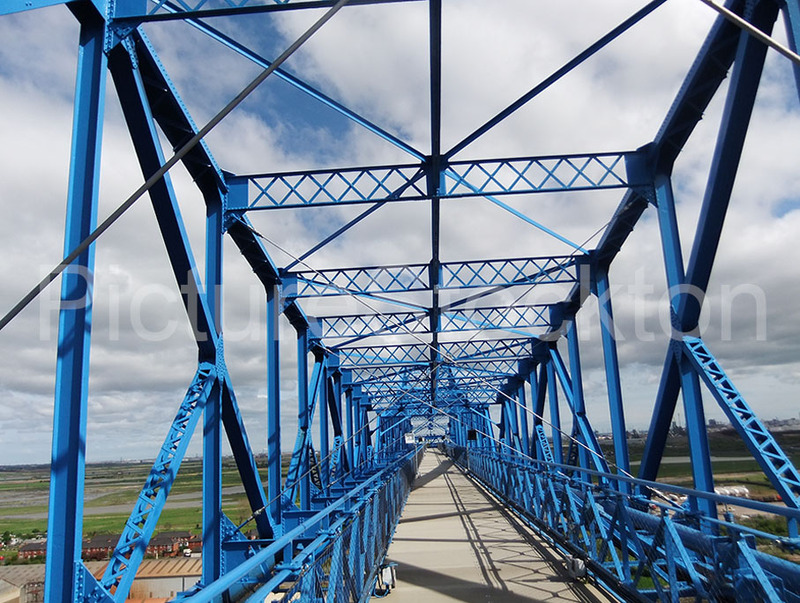 The latter is the first all welded steel bridge built in Britain. It is nice to see a colour photo, I think that the Arched Bridge is the new Infinity Bridge. interesting, good shot thank you. Is it still possible to walk over the bridge? I will be visiting Teesside again later this year and I’ve always wanted to do it. It would largely depend on how many steps there are and if there are landings as my 73 year old knees tend to whinge a bit. It was great fun to walk over the top as the steps were quite steep,we used to do it as young teenagers in the mid 50’s.I think it cost 6d to do it.We used to get the bus from Stockton walk over then bus back from Middlesbrough. I think they closed the walkway to stop people jumping off.